Local residents interested in learning about bicycle road safety can learn about safer riding practices at a class being offered by the San Diego Bicycle Coalition on Saturday, Feb. 2 starting at 9 a.m. at the Copley-Price YMCA in City Heights. The tree-hour session is aimed at cyclists of all skill levels and will cover general bike safety, emergency maneuvers, legal aspects of cycling, and rider responsibilities. The course will include a classroom learning segment which will be complemented by a on-bike session where attendees can practice maneuvers in an open lot prior to taking to the street. 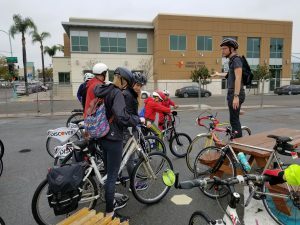 Kevin Baross, SD Bicycle Coalition program coordinator, explained that the class is set up so that people can experiment with what they have just learned. “We talk about theory in bike law, rules of the road and then do an hour on the blacktop with bike handling skills and simulating situations one might find themselves in and then do another another hour on the street putting to use with what we have learned,” Baross said. Andy Hanshaw, San Diego Bicycle Coalition executive director, shared with La Prensa San Diego that bicycle education is something the organization has done for several years throughout its existence, but can now be offered in specific neighborhoods thanks to a number of grants, such as an Office of Traffic Safety grant from the State and funding SANDAG’s iCommute program. With City Heights becoming a major hub for car-alternative transportation projects and key community for the City’s Climate Action Plan goals, offering a class in this neighborhood made perfect sense. “It is a central location and also where many people and organizations wanna see improvements in safety and we also advocate for change there to make the streets safer in the area,” Hanshaw stated. The course is open to all ages and skill levels. Helmets are mandatory for the on-bike segments. Organizers will have a limited amount of loaner bikes and helmets which will be available on a first come first served basis.